If you're looking for a cheap and pocketable digital video camera, Mustek's new DV520T mini camcorder could be worth considering. Aimed at the casual shooter, bloggers and web uploaders, the palm-sized camcorder can record VGA quality MPEG4 video at 30 frames per second with sound. It also shoots still images at 5.2-megapixels resolution, and has a 8x digital zoom and an IGBO flash. In addition it can record WAV voice files and has a built-in MP3 player. The Mustek DV520T has a 64MB internal hard drive and supports up to 2GB memory cards to expand storage. A 2-inch fold out, swivelling LCD display is built into the DV520T. 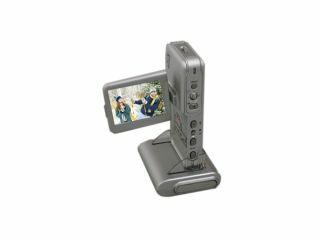 Images recorded on the Mustek DV520T can be easily downloaded to a PC via a USB 2.0 cable or from a memory card via a memory card reader. An AV-out cable means the DV520T can be hooked up to a TV or other AV source for playback. Available in June, the Mustek DV520T is expected to sell for around $129 (£65). For UK availability, contact VIP Computers on 0870 164 8501 or Bluepoint on 0870 121 8001.